For Disaster Preparedness: Pack A Library Card? In the wake of Hurricane Sandy, libraries in New York helped storm victims find documents, fill out forms, connect to the Internet and plan how to rebuild. There's a growing awareness of the important role libraries can play in disaster relief. This summer, NPR explores our nation's public library system. 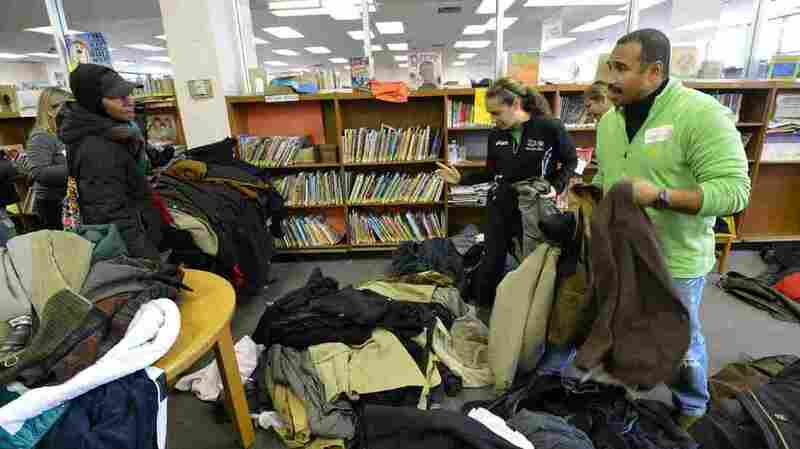 Volunteers at the Queens Library in the Far Rockaway section of Queens hand out coats to people affected by Hurricane Sandy. In the wake of Hurricane Sandy, libraries in New York helped the storm's victims turn a new page. Librarians helped thousands of people fill out relief forms, connect to the Internet and make plans to rebuild. The New Dorp branch of the New York Public Library in Staten Island wasn't damaged during Sandy. But just a few blocks away, houses were inundated with as much as 16 feet of water. And days after the storm, many of the library's patrons still lacked the most basic services. "We even had people asking if they could use the restrooms to clean up a little bit," says Barbara Byrne-Goldie, a librarian at New Dorp. "They still didn't have running water, or hot water. So we came in very handy as community centers, that's for sure." They still didn't have running water, or hot water. So we came in very handy as community centers, that's for sure. Byrne-Goldie, who has been at the New Dorp branch for nearly 20 years, says she and the other librarians knew many of those patrons personally and went out of their way to help. "People registering for FEMA — we showed them after we learned how to help them to register online for FEMA. That was a big request. And then just being an ear to listen compassionately. And maybe hug someone if you've known them from working with them for years here." Later, the library hosted free financial-planning seminars for Sandy victims. And it wasn't just local residents who used the New Dorp library in the days after the storm. "We had groups of FEMA workers," Byrne-Goldie says. "We had groups of Red Cross workers using our facility as a gathering place, and also to print out information about streets and what house had they knocked on the door of yet." Across the city, libraries were packed in the days after the storm as New Yorkers struggled to get back on their feet. New York Public Library President Anthony Marx says he'd never seen anything like it. Like hundreds of New Yorkers, Marx spent the week after the storm at the library's mid-Manhattan branch because the flagship Fifth Avenue building — the one with the lions in front — still didn't have power. "We had twice as many people as we would usually have, despite the fact that the subway wasn't working — it was hard to get here. You could just see that New Yorkers love their library," he says. And it's not just New Yorkers. Across the country, in places like Louisiana and Oklahoma, libraries have served as crucial hubs for information and help in the aftermath of hurricanes and tornadoes. And federal emergency planners have noticed. "The Federal Emergency Management Agency classified libraries as an essential service — like one of the things that would get early funding so that communities could recover," says Jessamyn West, a librarian in Vermont and a moderator of the popular blog MetaFilter. "People are finding in the wake of the natural disasters that we've seen — lots and lots of flooding and hurricanes and storms and tornadoes — that getting the library up and running with Internet connectivity or air conditioning or clean bathrooms or a place that you can plug in your phone really has benefit to a community that's in a recovery situation," she adds. At the tiny South Beach library branch in Staten Island, staff members like Kathleen McKenzie found themselves working as de facto therapists for patrons who were hard-hit by Sandy. "They'd stop and speak for hours to us. Just pour their hearts out," she says. "So what we did was offer what the library offered and that was to not charge any fees or fines and excuse anything that was lost in Hurricane Sandy. But we also asked if we could do anything on a personal level." In one case, the librarians went beyond NYPL policy and reached into their own pockets to help longtime patron Rosalind Gutierrez. "They really felt bad for me," she says. "And I didn't want to take anything, 'cause I'm not like that. But I had to take." Gutierrez is something of a legend inside the New York Public Library. Over the years, she's gathered tens of thousands of signatures to protest cuts to the NYPL's budget. During Sandy, her home in Staten Island was flooded. She ended up having to sell the ruined structure for just $50,000. Gutierrez — and her family of five people and two dogs — had nowhere to stay, so the library staff pooled their resources to give her some money to sleep in a hotel. Gutierrez is returning the favor. "I already lost everything," she says. "I didn't want to lose this place either. I just didn't want to lose something that I've been working for." After the storm, she redoubled her advocacy for the library — with some extra inspiration from a famous underdog. "Before I go out, I prepare myself. I listen to the Rocky theme song. And it works me up. I do my warm-up, you know, mentally, physically. And then I go out and do it. ... No matter how hard you get hit, it's how hard you can get hit and keep moving forward," she says. Gutierrez estimates she has gathered more than 4,000 signatures since Hurricane Sandy. It's her way of paying the South Beach library back for everything it's done for her — and her community — since the storm. And this year, there were no cuts to the NYPL's budget.